When I first heard about this book, I became giddy with glee. 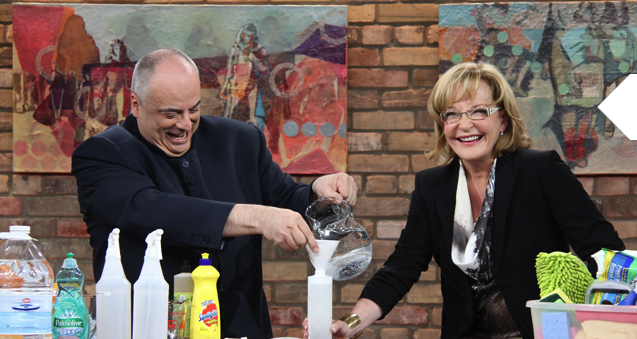 As a long time fan of Charles MacPherson, or as he is fondly referred to on the Marilyn Denis show as Charles the Butler, I’ve always found his advice poignant, proper and practical. It’s hard to take notes watching a TV show, and even harder trying to remember all his great advice, so The Butler Speaks is a fabulous must-have guide to stylish entertaining, etiquette and the art of good housekeeping. Iron Man (or Woman): One thing that came as a shock to my ego is that apparently I don’t really know how to iron a shirt. It makes sense now that I think about it. It always takes me twice as long, and after I “think” I’m done, I find myself constantly frustrated to discover crease marks on the front of the shirt, or the sleeves. Perhaps now, one of the chores I hate so much might become one that I love? Oh, who’s kidding, I still won’t “love” it, I’ll just be able to do it faster and more efficiently, so I can spend more time indulging on one of my great pastimes – reading. Break bread with someone: Did you know that watching how a person eats bread can tell you what they know about table etiquette? Here’s a tip – always tear a small piece off to eat; do not use your knife to cut the bread; do not butter the entire piece of bread before eating. There are so many other little nuggets of neat etiquette rules in The Butler Speaks by Charles MacPherson. Pick it up for yourself and be “proper”. Better still, it makes a great host/ess gift that’s sure to be a conversation starter. One of the critics of the need for manners and etiquette, sociologist and economist Thorstein Veblen --himself unkempt and terse with lesser intellects-- observed that the norms of manners and etiquette have little practical "economic" value but are of unquestionable cultural value in establishing one's place within society's strata. But a counterpoint to this is that manners and etiquette should be timeless: one may be rich but not necessarily well behaved whilst another may be of modest means and have impeccable manners -- whom would you rather dine with? Even if this is a questionable thought experiment it doesn't take away the value of maintaining manners and etiquette as a necessity in manoeuvering through society's hurdles. This accessible book is a useful guide and does it without snobbery.